More than a cancer-causing gene is needed to trigger pancreatic cancer, a study led by Mayo Clinic, Jacksonville, Fla, has found. A second factor creates a “perfect storm” that allows tumors to form, the researchers say. The study, published in a recent issue of Cancer Cell, overturns the current belief that a mutation in the KRAS oncogene is enough to initiate pancreatic cancer and unrestrained cell growth. The findings uncover critical clues on how pancreatic cancer develops and why few patients benefit from current therapies. 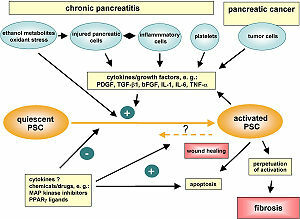 The findings also provide ideas about how to improve treatment and prevention of pancreatic cancer. The research team, led by Howard C. Crawford, PhD, a cancer biologist at Mayo Clinic’s campus in Florida, and Jens Siveke, MD, at Technical University in Munich, Germany, found that for pancreatic cancer to form, mutated KRAS must recruit a second player: the epidermal growth factor receptor, or EGFR.A third genetic participant known as Trp53 makes pancreatic tumors very difficult to treat, the study showed. The scientists also found that EGFR was required in pancreatic cancer initiated by pancreatic inflammation known as pancreatitis. A protein that can be detected in blood samples may one day serve as a biomarker for early-stage lung cancer, according to new study results. The findings, published October 16 in the Proceedings of the National Academy of Sciences, suggest that measuring the levels of a variant form of the protein Ciz1 may help detect lung cancer early and noninvasively in high-risk individuals. “We have struggled to find cancer biomarkers that are disease-specific, and this may be a step in the right direction,” said Dr. Sudhir Srivastava, chief of NCI’s Cancer Biomarkers Research Group. He called the study “promising” but noted that the results will need further validation. Researchers led by Dr. Dawn Coverley of the University of York in the United Kingdom found that the “b-variant” form of Ciz1 was present in 34 of 35 lung tumors but not in adjacent tissue. Additional experiments showed that an antibody specific for this Ciz1 variant could detect the protein in small samples of blood from individuals with non-small cell lung cancer (NSCLC) and small cell lung cancer (SCLC). In two independent sets of blood samples—from 170 and 160 patients, respectively—the researchers showed that variant Ciz1 levels above a certain threshold correctly identified 95 to 98 percent of lung cancer patients, with an overall specificity of 71 to 75 percent. Using the second set of samples, they showed that the level of variant Ciz1 could discriminate between patients with stage I NSCLC and age-matched heavy smokers without diagnosed cancer, individuals with benign lung nodules, and patients with inflammatory lung disease. Although the high rate of false-positive test results seen with variant Ciz1 is a concern, the authors noted that a blood test for the Ciz1 variant might ultimately be shown to be useful when combined with low-dose helical computed tomography, also called spiral CT, for lung cancer screening. In that context, the test could confirm the presence of lung cancer in patients who have suspicious spiral CT results, reducing the need for invasive procedures to confirm a lung cancer diagnosis. And, if used before spiral CT, “the test could reduce the number of people who undergo imaging…[because] the false-negative rate is very low,” Dr. Coverley wrote in an e-mail message. To assess variant Ciz1 levels, the researchers used a laboratory method known as Western blot analysis. However, this approach could not be routinely applied in a clinical context, the researchers acknowledged, so “a more streamlined method” for testing would need to be developed. Supported in part by NCI Early Detection Research Network Grant U01CA086137. A majority of patients who opt to receive chemotherapy to treat newly diagnosed metastatic lung or colorectal cancer believe chemotherapy might cure their cancer, according to a recent survey. The survey results suggest that optimistic assumptions about the benefits of chemotherapy may hamper patients’ abilities to make informed treatment decisions that align with their preferences, said the researchers who led the study. The findings were published October 25 in the New England Journal of Medicine. Dr. Jane Weeks of the Dana-Farber Cancer Institute and her colleagues interviewed 1,193 patients tracked by the prospective, observational Cancer Care Outcomes Research and Surveillance Consortium (CanCORS) study, 4 to 7 months after diagnosis. All of the patients had been diagnosed with stage IV lung or colorectal cancer and had chosen to receive chemotherapy. A surrogate was interviewed when a patient was too ill to participate. The survey asked patients how likely it was that chemotherapy would cure their disease, extend life, or relieve symptoms. The researchers also collected data on patients’ physical functioning, communication with their physicians, and social and demographic factors. The majority of patients did not appear to understand that chemotherapy was very unlikely to cure their cancer (81 percent of those with colorectal cancer and 69 percent of those with lung cancer). Black, Hispanic, and Asian/Pacific Islander patients were more likely than white patients to believe that chemotherapy would cure them. Nevertheless, most patients believed that chemotherapy was more likely to extend their life than cure them. Educational level, functional status, and the patient’s role in treatment decision making were not associated with inaccurate expectations about chemotherapy. This research was supported by grants from the National Institutes of Health (U01 CA093344, U01 CA093332, U01CA093324, U01 CA093348, U01 CA093329, U01 CA093339, and U01 CA093326).